Disclaimer: This is meant for reference only. You should never rely on any piece of technology when there is a possibility of getting lost. Always bring a proper map and compass as your primary means of navigation. 1. Install Rmaps from the android market. 2. Download and unzip Mobile Atlas creator. 3. Run the exe file. 4. Set map source to "Yahoo maps" and zoom to the approximate area you want. You can zoom in with the mouse wheel and move around with right click. 5. Change the map source to "Terraserver-USA Map." 6. Select the zoom levels you want. I usually select all of them up to 16. selecting 17 will make the files excessively large without adding much detail. 7. Use left click + drag to select the map area. 8. Under "atlas content" type in the name you want to use for your map. Then click "add selection" to add it. 9. Change the format to "RMaps SQlite." 10. Click "create atlas" to download and compile the map. This may take a while depending on the area you selected. 11. When that is done, the file will be saved in the "atlases" folder. Move it to /sdcard/rmaps/maps on your phone. 12. Unplug the phone and open the Rmaps application. 13. Hit the menu button, then select more, then settings. 14. open "user defined maps" then click the name of your map. This will bring up a menu. Tick the "enabled map" box to enable it. 15. Go back to the main screen, hit menu, maps, then the name of your map to display it. For longer hikes, it will probably be necessary to have multiple batteries. You can always buy more manufacturer batteries, but my preferred method is with an external AA recharger (like this) and some NIMH batteries. This way, I can use the same batteries with my camera equipment, flashlights, etc. It's also cheaper. 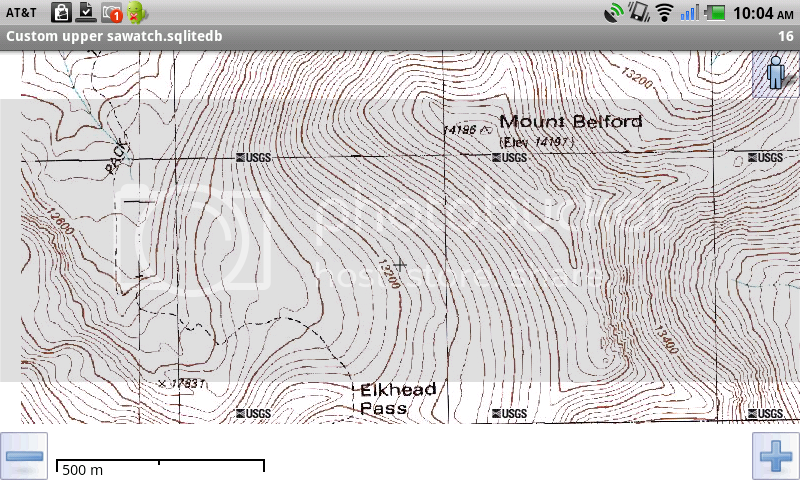 If the USGS map doesn't have markings for a trail you want, you can use a GPX track to add it. What you need to do is google the name of the trail and "GPX" and find a log. Hikers like to record them and distribute through blogs and such. Once it's downloaded, find the "GPX" menu on the left, open it, and use the "load GPX" button to select it. When it is loaded, use this to set the appropriate map area, and then continue as normal. When loading it onto your phone, copy the GPX track as well. To load the track, pull up the menu, then select more, then tracks. Hit menu, import, then point it to the location of the GPX file. Multi-day hikes will often be broken up into smaller parts, usually numbered. Unfortunately, this program is only capable of displaying one at a time, so be sure to switch off when it runs out.